During bunkering operation between the bulkcarrier "Celia" and the "Abrau", an oil spill occurred at berth No. 103 in the port of St. Petersburg on Jan 27, 2019, at 06.30 a.m. Approximately, 0.2 to 0.3 cubic metres of oil spilled on the deck and overboard from the "Celia". Two oil spots were formed on the ice in port waters measuring 3 x 1.5 metres and 2 x 1.5 metres. The port tug "Borey" started with oil cleaning operations at 6.20 p.m.The cleaning of the oil-snow mixture from the ice alongside the "Celia" was suspended after about two cubic meters had been collected, at 8 p.m. Further cleaning operations were planned on Jan 28 at 8 a.m.
After the engine failure and power loss the "Abrau" encountered in the Sea of Marmara, in pos. 40 50 N 28 58 E, on Jan 14, 2018, the crew was unable to effect repairs. Ther tanker remained stationary at Istanbul anchorage on Feb 3. Shore based technical support was requested by the owners, and the teams were on board and still working in order to complete the permanent repairs. The class surveyor also conducted an initial inspection. On Feb 27 the ship was still anchored 2.5 nautical miles from Zeytinburnu. 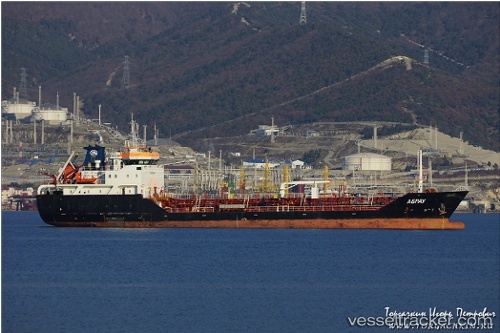 The "Abrau", while enroute from Novorossiysk to Derince, in a laden condition, experienced engine failure and loss of power in the Sea of Marmara, in lat 40 50.4N, long 28 58E, on Jan 18, 2018, at 11 a.m. Repairs have been commenced by the crew. The vessel was drifting in winds and currents in the meantime before it shifted to Istanbul Anchorage and dropped anchor, in order to carry out permanent repairs.